I like to think that birthdays are special and you are entitled to feel a little more special on this day than the other days of the year. After all, this is the day you arrived in this world, the day you were first cradled in the arms of your loved ones, the day your entire life began - and that has to mean a little something inside your heart. Yup, I don't subscribe to the belief that every day can be Valentine's Day or that a birthday is but just a birthday. Be it anniversaries, birthdays or special occasions, they mean something extra to me and no, they ain't just any other day. That doesn't mean I need my loved ones to lavish me with gifts and concern or that I need to do something big on these special days, but it does mean that I feel a tad more unique, a little more celebrated, and most importantly, I feel thankful when I look at what I have and start pondering about my life. So, I turned 35 over the weekend. That kind of sounds like half of my life has already flown past and it does make me reminisce, make me a little sentimental and make me start to wonder what I'm doing right, or wrong, with my life. There seems to be so many things I've achieved yet so much more I've yet to accomplish. Being a mum to three lovelies, having received a master degree and being able to survive as a stay-at-home mum for over eight years, I think these can be considered as my best achievements in life. Yet, there is so much more I wish to do with the rest of my life. I want to write my own children's book, I want to do up more videos, I want to learn new cooking recipes, I want to start an exercise regime and rid those love handles, I want to travel more with the kids, I want to teach them everything I know, I want to see them grow up (even though it freaks me out when I realise how fast time passes) bit by bit, I want to finish reading all the novels that I said I would (I don't even have the time or strength to flip a page these days), I want to go on couple dates with the hubby and perhaps even take a couple vacation one day. Having aspirations doesn't mean that you are not contented with what you have at the moment. It gives you something to hope for, something to look forward to, and motivates you to keep going strong. On the contrary, I'm very happy with my life now and I wouldn't trade what I have for anything in the world. A cosy home to call our own, a comfortable lifestyle, a closely-knitted family and kids who see me as the best mum in the world, no matter all the wrongs I've done. We were invited by Shangri-La Hotel to check out their newly opened Buds play space and the hubby suggested that the staycation should fall on my birthday weekend. (Stay tuned for my review and giveaway next week, okay?) A part of me rejoiced and thought it sounded like a great idea while another part of me thought "Gosh, that means I gotta work through the weekend, stay active online and go around taking tonnes of pictures and videos instead of being able to chill and relax." Yup, it takes a blogger to understand that second part but anyway, I chose to go ahead with the idea since a family get together would be the perfect way to spend that special day. It ended up that the hubby almost couldn't make it due to his demanding work and I was all set to bring the kids on my own to celebrate the weekend. Luckily, his schedule was amended last minute and two days before, he told me that he would be able to join us after all. Fwah! Phew! Heng heng ah! Despite the occasional whines and tantrums from the kids, the moments when the hubby and I didn't see eye to eye, or the fact that I was constantly logged onto social media or trying to take pictures of every nook and cranny, we had a fun time after all and seeing those huge smiles on the kiddos was what made me beam with joy. Yup, for good or bad, my happiness is very much dependent on their well-being and they usually go hand in hand. I've reached the stage where I get well wishes from friends on Facebook, WhatsApp, Instagram and PMs - but less than a couple will make the effort to meet up, celebrate or send a gift. That essentially means I usually spend my birthday with the family, which includes my parents, and I don't look forward to receiving much gifts except those from them too. This year, my mum treated me to a steamboat dinner at J Pot, my dad gave me an ang pow, my in-laws gave bird's nest and a thoughtful friend sent over a cake and cookies. I was also presented with a couple of surprise gifts from the hubby and the kids, one of which was a green house complete with seeds that I look forward to setting up with the kids, and the other was a Yoga set with instructional DVDs. Lol, yes, even the hubby thinks I ought to keep fit and lose some weight. But you know what I always love most of all on every of my birthday? 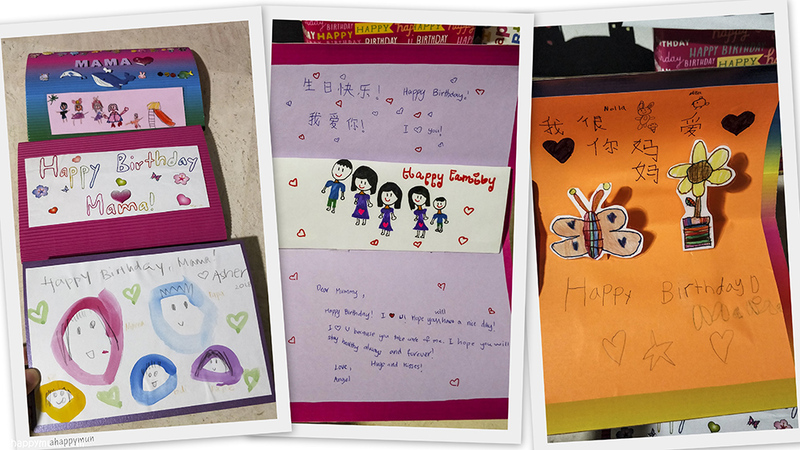 Without a shadow of a doubt, I most look forward to receiving the handmade cards from the kiddos. It wasn't that much of a surprise this year because the girls needed my help in getting materials, laminating their drawings and helping them do a simple pop-up. Plus, I did Asher's card with him and guided his hand in drawing the faces and writing the words, so it felt like I was kind of doing it for myself. Haha. Nonetheless, it was awesome to see the pictures of a happy family of five in all the cards. Very consistent! I also love seeing the heartfelt message from the big girl and know that she feels thankful and lucky to have me as her Mama, just like how I think I'm the luckiest person in the world to have them too. These cards will be kept with me for as long as I live, and I know I will love to take them out from time to time during my twilight years and think about the good old days. The days when I struggle to keep it together and not crumble, the days when I hardly have time to breath or go to the loo, the days when I make a big mess in the kitchen yet the kids think I just made the most delicious dinner, the days when I get stares from passers-by because I have a bunch of noisy kids with me on the MRT or bus, the days that I am able to thrive on minimal sleep not because I don't want to rest but because I can't, the days when I'm the most needed person in the lives of at least three people, the days when I hear the kids yelling for "Mama!" a thousand times, the days when I have to multi-task every minute because 24 hours a day is simply insufficient, the days that seem so crazy and chaotic yet they make my happiest memories in life, the days that I hope don't pass me by too quickly because I earnestly wish to savour every bit of my children's growing up. These are truly some of the best years in my life and I'm so deeply thankful to be where I'm at. Happy 35th birthday to me.